With one thundering flash of might, the conniving snake was no longer of this world - its reign over the year of 2013 collapsing in an instant - and so began the year of the BEAR. Released on the same day as Europa Report, CAPRICA is BEAR MCCREARY’S sixth-score release of 2013, putting him alongside MARCO BELTRAMI and JOE HISAISHI as one of this year’s most prolific composers. That said, the single season of CAPRICA originally aired in 2010, with the pilot episode’s original score being released in 2009. Coming almost two years after the airing of the show, was it worth the wait? 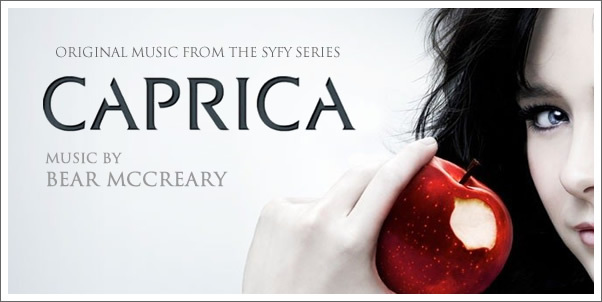 Perhaps to make up for such a long wait, CAPRICA’S release is made up of two discs, totaling almost 2.5 hours of BEAR MCCREARY’S score and original songs. This will no doubt please fans of the show and the score, but there’s a distinct feeling throughout that with a little more precision, CAPRICA’S running-time could have been drastically reduced without suffering any noticeable loss in quality. Listening to the series’ score after having heard the pilot score is something of a disappointing experience. Not because the pilot score promises particularly great things for the full season’s score, but because the majority of the second release offers merely more of the same, rather than reaching new heights as one would expect given how much more music there is to work with.